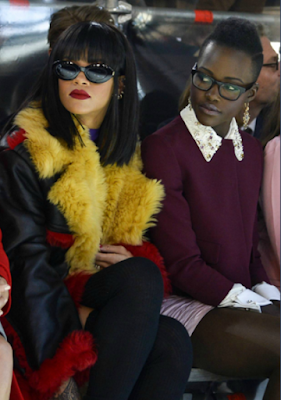 Y'all remember this picture of Rihanna and Lupita Nyong'o that went viral after twitter users created a movie scene out of it? Well the movie is finally happening. After an aggressive bid at the Cannes Film Festival, Netflix has won the rights to produce the movie. The movie will be directed by DeVernay while the screenplay would be written by Issa Rae. 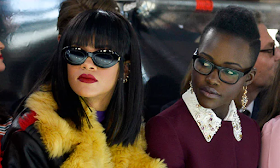 The whole idea of the movie was created after a twitter user shared a photo of Rihanna and Lupita at a FAshion in 2014 and captioned it; “Rihanna looks like she scams rich white men and lupita is the computer smart best friend that helps plan the scans,” The tweet has now received over 96,000 retweets (It’s since been reported that the original idea actually came from Tumblr). Both stars then expressed interest in the idea on Twitter, followed by Selma director DeVernay and Insecure writer Issa Rae. Lupita wrote: "I'm down if you are @rihanna"
"I'm in Pit'z," Rihanna replied Lupita. "Issa possibility". It’s unclear yet as to whether the film will follow the same idea as the initial tweet but it is reported that the he original Twitter users who imagined the concept for this film will be credited and included in some form.